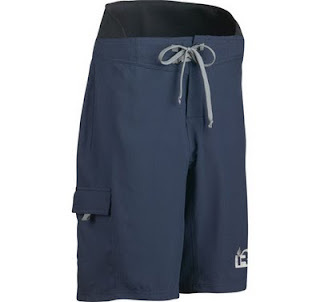 In this part of our summer kit review we'll have a look at shorts. Alot of people paddle in just a pair of board shorts, which are great when its really warm, but when the weather takes its usual 'British summer' turn for the worse, something a bit warmer is often a good idea. The shorts featured here all have some sort of liner, either neoprene or polypropylene thermal, to increase the warmth, and your comfort. They are ideal for all levels of paddling, whether your hitting some alpine whitewater, going for a paddle along the coast line, fishing, or just enjoying getting out on your local river, lake, estuary or canal. The Palm Gradient short are a long cut board short style, but with a neoprene liner to keep you warm and comfy, even if you are sitting in a puddle. The extra length combines with a reinforced panel over the knee, to protect you from the inside of your kayak. They also feature a hidden pocket, and a Velcro adjustable waist for a perfect fit. The Peak UK Bagz feature a light weight outer fabric combined with a warm and comfy polypropylene thermal liner. The Liner is made from the same soft, stretchy fabric that is found in light weight thermals, ideal for helping to keep you warm, and the outer fabric is soft yet hard wearing, they feature a pocket on the leg and a drawcord waist. The Immersion Research Neo Lined Guide shorts feature a hard wearing outer fabric, combined with a high backed neoprene liner. 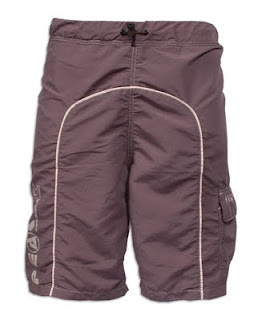 The shorts feature a reinforced rear panel for added durability, and a side pocket. 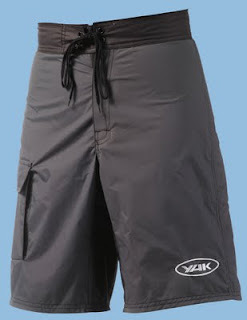 The Yak Neoprene lined board shorts feature a waterproof breathable fabric outer, a 2mm neoprene liner, a two point adjustable waist and a cargo pocket. 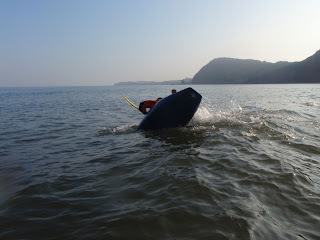 Why not check out the whole AS Watersports shop website, Or our Summer Cags review, or our Summer thermal review. In this part of our summer kit review we'll take a quick look at what waterproof cags you could be wearing to help keep the wind off, the water out and the warmth in. We've split this section into two parts. Firstly we have cags that are designed for the more adventurous paddler who is looking for a short sleeved cag to keep the water out while surfing or paddling whitewater. 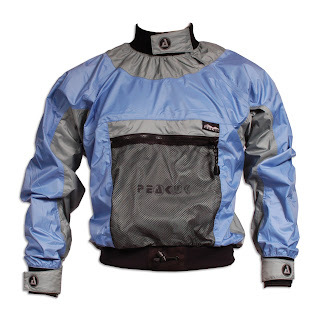 And in the Second part we have lighter weight short and long sleeved cags designed for those who are doing some touring, canoeing, fishing or just generally enjoying being out on the water. 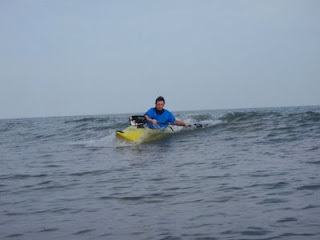 The Yak Fusion is a superb lightweight short sleeved cag, suitable for all kinds of moving water paddling and surfing. Its made from light weight breathable ripstop fabric and features a high performance fit with seamless under arm technology, semi dry glideskin neoprene neck and bicep seals, a fully adjustable neoprene waist band and a large front pocket with laser cut drain holes. Palm Sidewinder short sleeved cag. The Palm Sidewinder is super tough whitewater short sleeved cag, for those who want to do some serious whitewater. Based on the range topping Sidewinder cag the short sleeved version features all the same great features, just without the sleeves! Made from super tough, super breathable three layer XP150 Fabric, and featuring Latex neck and biceps seals for dryness, and two chest pockets. 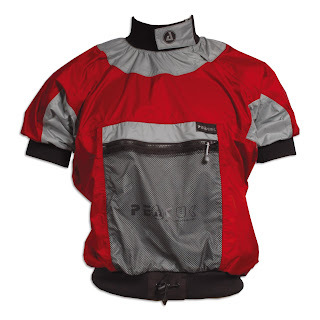 Palm Apex short sleeved cag. Finally the Palm Apex short sleeved cag is a tough breathable semi dry cag, for paddlers who want comfort and great performance all in one. The Apex features tough, breathable 3 layer XP150 fabric, but with the comfort of glide skin neoprene neck and bicep seals, and a single chest pocket. Short sleeved cags are great for whitewater paddlers who are heading off to sunny climes for a paddling adventure, or maybe making the most of a summer thunder storm on their local whitewater run. When it comes to summer whitewater, or foreign adventures most paddlers aren't necessarily looking to keep all the water out, it's more about keeping the wind chill to a minimum, or maybe even keeping the sunburn risk down! The cags featured above would be fine for any whitewater adventure where you think you don't need the protection of a full long sleeved cag. The Palm Newfoundland is a light weight cag ideal for touring, fishing and general paddling. 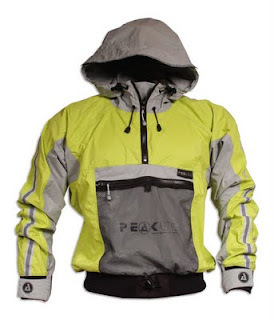 It's made from Palms XP50 2 layer breathable ripstop fabric. It features a large front pocket, a storm hood, adjustable neoprene wrists and a drawcord waist for simple adjustment. The Delta Cirrus is a super light weight packable cag. 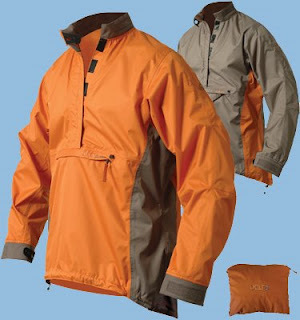 Made from ultra light weight ripstop, it features a large venting neck, soft, comfy and adjustable neck and wrists and the whole jacket neatly packs away into its own pocket, ideal for storing in your boat during a trip or when you’re trying to keep weight & bulk down when packing. The Peak UK Tourlite range features three cags, all made from the same breathable, light weight, 2.5 layer fabric. There is a short sleeved version, ideal for warm trips, or as an emergency back up, a long sleeved version that is ideal for all sorts of paddling uses, and a hooded version ideal for keep the summer rain off of your head! They all features easy to adjust neoprene wrists and draw cord waists, and a large mesh front pocket. The hooded version also features zipped venting front, while the long and short sleeved versions features a comfy adjustable neoprene neck. All of the cags featured above are ideal for summer paddling, offering water proof and breathable fabrics, and simple adjustments to stop too much water getting in round your wrists and neck. When worn in conjunction with a light weight summer thermal they offer enough protection to enable you to paddle not matter how miserable the forecast sounds. And if the sun does pop out, they feature enough ventilation to stop you over heating too quickly and they are light enough to pack up small enough to store away in you boat. Or pop into the shop to try one on from our extensive range. Well summertime is here, but that doesn't always mean that the weather will be good. Just a quick peek out of the window today reveals more grey clouds and rain. So we thought we'd have a quick run through some of the great kit that we offer that is ideal for keeping you warmer, dryer and more comfortable when paddling in the 'warmer' months of the year. In this instalment we'll have a look at summer thermals. These are light weight, super stretchy Polypropylene thermals layers, that are designed to be close fitting and offer enough protection to keep the chill off when the clouds roll in again. They can be worn on their own should the weather be warm enough, but are also ideal under a light weight windproof top should the weather close in on you, and for paddlers who want to keep on through the winter they can be worn as a base layer under a thicker thermal during the winter. 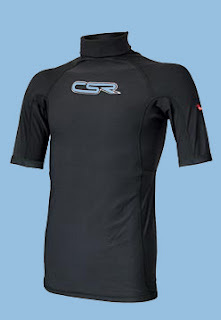 CSR Plamo poly plush short sleeved thermal top. First up we have the CSR Plamo. 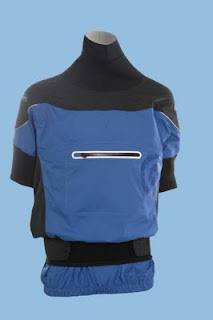 The Plamo is lightweight, but very warm ergonomically designed thermal top. It features high wicking Polypropylene fabric for warmth and comfort, soft, stretch construction for freedom of movement and flatlock seams to prevent chafing. Comfortable for all day paddling its great on its own under a buoyancy aid, to keep the sun off, or to keep the warmth in. It can also be worn with a long john style wetsuit, or as a winter base layer. Alder Spirit, womens short sleeved thermal top. Next up is the Alder Spirit thermal top. The Spirit is available in mens versions, womens versions and Junior. They are all made from the same light weight, soft, comfortable and stretchy polypropylene fabric. The mens and ladies is available in both long and short sleeve, the junior is only available in short sleeved. Once again another fantastic bit of kit for summer paddling, great for wearing on its own, under a light summer cag, as well as being useful as a base layer for cold winter paddling. Just because they weather isn't all blue sky and sunshine doesn't mean you can't be out enjoying paddling your kayak or canoe. As the old adage goes "There is no such thing as bad weather, just the wrong clothes" So don't get caught out this year. 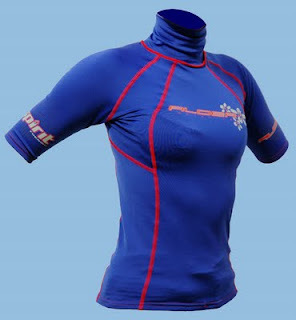 Why not check out our range of thermals on the AS Watersports website and make sure your in the right clothes this summer! We had a little visit from Tim from Pyranha last week. He brought with him some brand new kayaks and sit on tops. The most interesting was this new boat from Venture, the Flex 11. 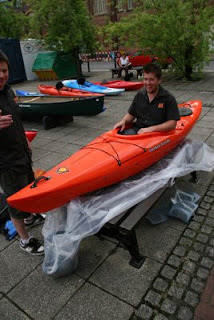 This is a new general purpose touring kayak. By that we mean it can be used fro most touring stuff except prehaps very long journeys as it would be a touch slow. But out on the canal we found it had great acceleration and brilliant stability. 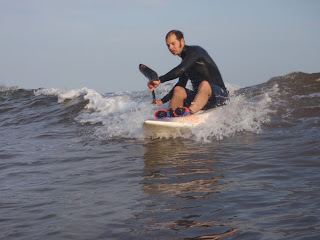 The large volume made it very easy to get in and out and would suit even the largest paddler. 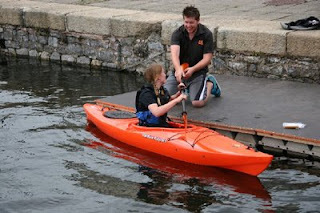 Actually its a bit better for the larger paddler as for Kayleigh it felt a bit big. She was rattling around inside. Sam found it much nicer. In fact you can see he didnt want Kayleigh to have a go, holding on to the paddles to the last moment. The Flex 11 comes after the Pyranha Fusion and is the touring version of that kayak. Whilst the fusion is GP/ white water the Flex is GP/touring. It features a stern hatch which is massive, an elastic paddle or rod holder, deck elastics for chucking your map or wind proof under, the same excellent fliptop back band as its bigger sisters the Easky range and the recess for the Venture deck pod. The hull has the same great characteristics as the Easky range with a nice flared bow, big wide flat section under the seat for initial stability and a nice keel line flowing in to the stern. We have yet to take it for a long trip but will report back when we have. Failing that come and have a go your selves. All this for just £499 makes it a great day tripping boat with potential for more. New Inflatable kayak package deal added to the shop. We have just added another great value package deal to the shop and website. 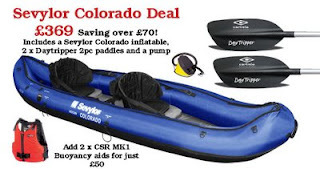 Inflatable kayaks are great for those who are short of space, wether its in the car or at home. 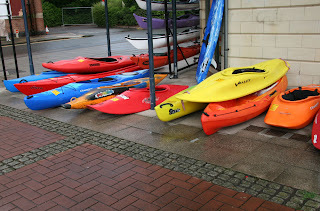 Secondhand Kayaks come and go fairly quickly here at AS Watersports. But we seem to be having a High second hand boat moment currently. We've got a bit of everything too, junior kayaks, sit ons, playboats, surf kayaks, touring kayaks, sea kayaks, recreational kayaks, whitewater kayaks and doubles! And don't forget that if there's a boat you like but your not sure about you can always try it for free on the canal, right outside the shop! Here is a date for your diaries, this years South West Canoe Show will be taking place on Saturday the 3rd of October 2009. The show will once again be on the Piazza outside of the AS Watersports shop. Don't forget it's the UK's Biggest free Canoe Show! 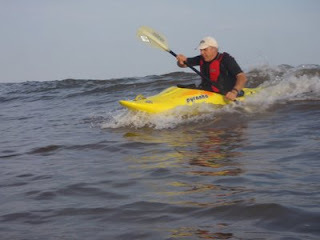 The weather here in Exeter has been really hot recently, and if there's one thing hot kayakers like to do, its mess about in the water. The hot weather has killed of any hope of whitewater or playboating, and the surf has been pretty much non existent as well. But a rare pulse of southerly swell popped up on the charts this week, meaning that an after work surf was easily achievable. 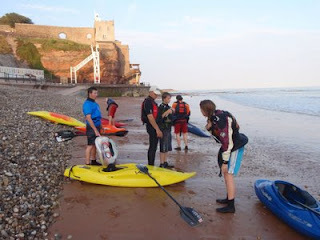 So Tuesday night saw Team AS load up a variety of craft and head to Sidmouth. Now its fair to say that the swell was hardly what you'd call big, some people might not have even called it surf. But to a bunch of hot kayakers, at the end of another long day, it didn't really matter. 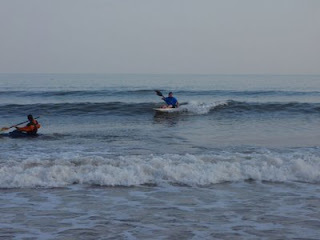 What mattered was getting wet, having fun and trying to surf a few 'waves'! We spent almost two hours splashing about, being silly, having water fights, and occasionally trying to catch a wave. It was the perfect antidote to the hot weather. 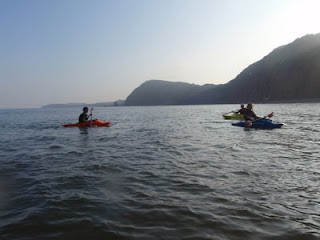 Kayaking is about have fun with a few friends, and thats certainly what we did! Not a bad little set, it almost looks like surf!